EzCheckPrinting check writing software for Mac saves your time and money on checks. Writing a check on a Macintosh machine is so easy. 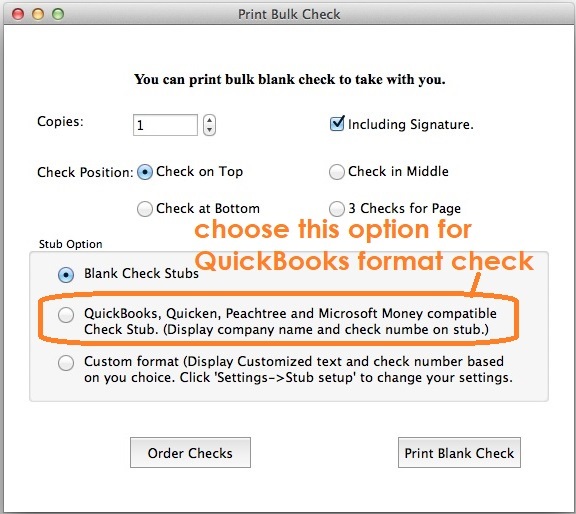 Here is the step by step guide on how to print QuickBooks compatible checks that you can fill in manually or by other software. ezCheckPrinting allows customers to design and print professional checks with MICR encoding and logo on blank stock. You can use it as stand-alone computer check writer on both Windows and Mac machine. This check writer can print regular checks, blank checks and draft checks. If you have not installed this software, you can download and try it free with no obligation and no credit card needed. You are welcome to download and try ezCheckPrinting Software. No registration needed and no obligation. You can even get this check printing software and the compatible blank check paper for FREE if you check out through TrialPay.